As part of Mute‘s fortieth ‘anti-versary’, the label is making available very special limited edition vinyl versions of selected releases from their four decades of releasing and curating incredible music. To celebrate this element of Mute 4.0, we’re re-posting reviews of those special albums from the depths of the Documentary Evidence archives. Full details on the releases can be found here. The Devil’s Walk, Sascha Ring‘s first Apparat album for Mute Artists is perhaps one of the most absorbing and moving pieces of music I’ve ever had the privilege of listening to. I write this like I’m surprised somehow, but I shouldn’t have been. I bought all three singles before the album was released (‘Ash / Black Veil’, ‘Black Water’ and ‘Song Of Los’) and with each one found myself deeply affected by the way those songs played subtly with my emotions. Thus expectations were raised fairly high from the beginning for The Devil’s Walk, though with that came the fear that the mood of those three tracks couldn’t be sustained across a whole LP. That fear was unfounded; it can. That said, I’ve not finding it especially straightforward to write about The Devil’s Walk, since the exact word that I’m looking for to describe this album fails me. What I do know is that there is a sense of unifying sadness, making the album less about individual tracks and more about the overall sound. Uplifting moments are frequent, but fleeting and unexpected. Tracks will be progressing along a introspective, reflective path and then, out of nowhere, a subtle chord change will allow the light to seep in ever so slightly and just briefly, lifting the mood somehow; yet that inward-looking feeling is still there, underneath, meaning that those bursts of comparative euphoria, when listened to more closely, are never actually that uplifting after all. iTunes and Mute Bank‘s website classifies The Devil’s Walk as an ‘electronic’ album, which to me creates a totally incorrect perspective on this album. Sure, it has electronic elements and I dare say a lot of this LP came about after tinkering with recorded sounds and vocals in some software package on a shiny Macbook, but in terms of instrumentation that tag doesn’t come close to describing this album. There are guitars – looped, acoustic passages; electric guitar patterns; what sounds like Stars Of The Lid / Labradford drones and distortion overtones; possible plucked ukulele riffs – reeds, harmonium sounds, strings and percussion that sounds like Photek dismantling an alarm clock or Matt Herbert recording breaks made entirely from the contents of his kitchen drawer. And everything comes with layer upon layer of slowly-evolving sound. Sometimes those layers produce something like the opener ‘Sweet Unrest’, wherein the final layer to be added is some dreamy choral vocals, giving this an icy spirituality. Sometimes it’s the dark reverb of ‘Goodbye’, where that Labradford connection manifests itself with some clanging Spaghetti Western guitar sounds in the vein of that band’s E Luxo So, only with a constant bass drum rhythm that is felt more than heard. Those subtle chord changes and hypnotic vocals (from Anja Franziska Plascha) give this an exquisite poignancy and a heart-wrenching quality. Sometimes those layers produce the strained, almost Massive Attack stasis of ‘Candil De La Calle’ where shimmering vocals play alongside a multi-channel percussion restlessness of amazing intricacy. ‘The Soft Voices’ blends layers of piano, possibly a dulcimer and a murmuring guitar sound in a way that I read about Brian Wilson perfecting on Pet Sounds, whereupon he took Phil Spector’s methodology of layering sounds to a new level, leaving the listener questing to know what this strange instrument they were hearing actually was, when it was in fact many instruments layered atop one another. Perhaps the knackered short wave radio sound in the background is Sascha Ring’s homage to ‘Good Vibrations’; strings arrive unexpectedly; drums that wouldn’t have sounded out of place on Tubular Bells kick in; a sense of euphoria is reached, only to dissipate suddenly, leaving a wobbly bass noise and a fractured vocal from Ring. ‘Escape’ is delicate balladry, an emotive vocal and lots of constantly-shifting, constantly-evolving loops; it’s the type of song that requires concentration to identify the fact that it is indeed constantly developing, while the addition of strings and ethereal harmonies gives this a filmic quality. Referencing Tubular Bells above, perhaps ‘A Bang In The Void’ is some sort of cross-generational electronica-weaned response to Mike Oldfield’s proggy opus, via Terry Riley’s In C. It takes a while to scale up via goodness-knows how many layers of pretty melodic sounds – I can’t work out what the instrument is or isn’t – and reaches a midpoint whereupon a broken trumpet pattern kicks in. I’m also reminded of Erasure‘s ’91 Steps’, as it shares some of the muted drama of that B-side. Closer ‘Your House Is My World’ feels like it’s been lifted straight from a soundtrack to an indie flick that hasn’t been made yet, or maybe Grizzly Bear’s soundtrack to Dedication; very Yann Tiersen; very subtle; very processed; very dramatic; I have run out of superlatives. I am frankly exhausted from over-thinking about what that one word, that one crucial word is that describes this album. The album was released in a gorgeous limited edition book CD format which includes lots of Gothic imagery, including a child-scaring etching on the front cover straight from an M.R. James ghost story. It also contains all the lyrics, and a read of those reveals the word I was looking for all along in this review – ephemeral. The atmosphere on The Devil’s Walk is one of ephemerality. Phew, I’m glad we resolved that. The limited CD format also includes the bonus track ‘The World Around You’ which is how Tears For Fears would have sounded if they’d been fed a diet of glitchy drone electronica. For Mute 4.0, The Devil’s Walk is being reissued as a violet LP edition. First posted 2011; edited 2018. Everyone will have, at some point or another in their lives, compared something to ‘being like War And Peace‘, probably without knowing that they’re referring to a novel by Tolstoy; they just know it’s a long book. Like a lot of important Russian literature, it is an expansive, long-form affair that progresses at a seemingly glacial pace over many years, almost at a real-time pace. Such works require a level of concentration and persistence that don’t quite chime with our modern need for quick fixes and instant fully-formed character deployment, something to read at the same time as listening to music, watching TV or walking to the train. Sascha Ring, or Apparat, has made it his business to create advanced electronic music that, like the work of Tolstoy and the other great Russian authors, has real, genuine depth. His pieces – a label far more suited to his music than ‘songs’ or ‘tracks’ – have a sonic complexity and density that requires the listener to focus on layers upon layer of detailed textural dialogue. Apparat’s first album for Mute, The Devil’s Walk contained gossamer-like ideas intertwining with one another like DNA coils to create one of the most beautiful, ephemeral works in the whole history of modern electronic music, laced with lyrics that were at once hopeful and melancholic at the same time, something that would resonate with the transcendent nature of the Russian psyche. Sebastian Hartmann is an uncompromising theatre director with a track record of staging difficult and challenging works as well as offering radical reinterpretations of classic plays; his productions include the controversial anti-war play Blasted by Sarah Kane, Anthony Burgess’s A Clockwork Orange, a stage realisation of the arid Paris, Texas by Wim Wenders, and works by Ionescu, Chekhov and Shakespeare. The ambitious Krieg Und Frieden – War And Peace – was staged for the 2012 Ruhrfestspiele festival in Recklinghausen, with imagery from Tilo Baumgärtel (from whose work the sleeve for Krieg Und Frieden is taken) and music by Apparat. Over time I have come to the opinion that theatre, much more so than film perhaps, still offers some of the greatest opportunities and blankest canvases for the experimental musician. 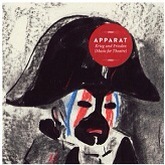 Nevertheless, Apparat’s music for Krieg Und Frieden includes a number of pieces that feel like they were written for a theatre audience’s need to hear orchestral reference points in a musical accompaniment. Those pieces – ’44’, both versions of ‘K&F Thema’, ‘Austerlitz’ – find Sascha Ring deploying the cello of Philipp Timm and violin of Christoph Hartmann from his live band to create austere, mournful and occasionally heart-wrenching melodies. These central pieces provide concrete proof that electronics may be capable of moving you but strings do it far more gracefully; here you find stately, regimented piano chords, music box simplicity and structures reminiscent of Irmin Schmidt, all mixed in with a sonic inventiveness that takes in drones and small, mechanical whirrings, clicks and feedback. The most obviously ‘stagey’ composition here (and by the way that’s not meant as a criticism) is ‘PV’, wherein layers of urgent melody rise up from a dark ambient soundscape before finally settling into a web of thunderous drums and skronking horn blasts. Add a trapeze and vast budget to proceedings and you have a perfect score to a Cirque du Soleil show that hasn’t been conceived yet. Offsetting the overtly theatrical pieces are challenging compositions that evoke bleak, anguished imagery. At the cheeriest end of that spectrum is ‘Blank Page’, featuring shimmering textures, clattering gears, snipping sounds, horses perhaps and a vague sounds of birds get overtaken by discordant noises. Those noises are finally offset by a vague melody that increasingly asserts itself on the front line of the piece; that melody brings with it a howling restlessness that evokes memories of some of Robert Fripp’s most evocative solo soundscape recordings. At the more unsettling end is ’44 (Noise Version)’, which is noise with a lower-case ‘n’. This distant cousin of ’44’ consists of delicately deployed feedback and sullen drones that position this somewhere between the quiet, frozen stillness of Thomas Köner and the industrial ambience of The Hafler Trio around the time of How To Reform Mankind. This is the sound of electronically-processed wind howling across the cruel and unforgiving frozen Russian steppes. There is, within the distortion and feedback, an elegiac quality, barely perceptible, just audible enough to release you from the intense gloom. Sascha Ring’s distinctive, strained soulful vocal colours two songs here. ‘Light On’ starts with sparse atmospheres and musings on desolate, deserted places, with skittering percussion and oscillating loops offsetting his Chris Keating-esque delivery, the whole thing coalescing over time into a sort of dense mutant dub rhythm. The album closes with a track that totally justifies the oft-abused ‘epic’ tag. ‘A Violent Sky’ is poignant ballad with jazzy percussion and Satie-esque piano clusters. This is the point where Sascha Ring finally flies free of any electronic rigidity into a warm, organic space that could provide a singularly inventive way forward after seven albums of clever electronica. First published 2013; re-edited 2015. 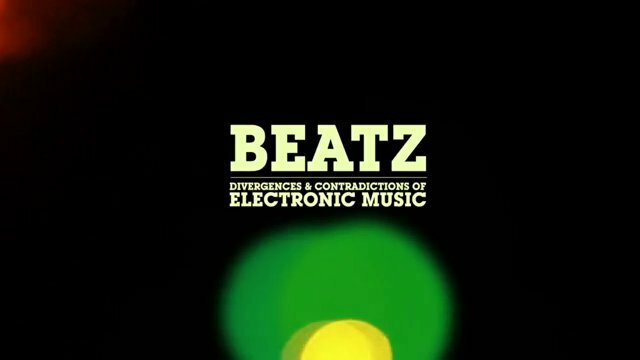 Beatz – Divergences & Contradictions Of Electronic Music is a documentary film by DJ Eduardo De La Calle that surveys the health of the global dance music scene. An independent – some might say underground – film, De La Calle’s methods veer toward the lo-fi, being largely just what he captured as he travelled around the world to interview many of dance music’s legends (Carl Craig, Derrick May, Marshall Jefferson, Carl Cox, Laurent Garnier, Juan Atkins) and newer talents in order to collect their views on what they think dance music has become and where it’s going. Although the likes of Garnier ultimately deliver a spirited reading of the enduring vitality of the international club scene, elsewhere the vibe is uniformly sombre. Much decrying is made of the likes of Beatport as a means of manipulating tastes and pre-filtering selections for the listener in a way that record shops never did; similarly impassioned comments are delivered about the supposed commodification of dance music and mp3s – particularly unmastered tracks constructed of nothing more than three loops (echoes of punk’s limited musicianship aside, such tracks inevitably lack any particular human quality) – and DJs that eschew proper mixing in favour of simply queuing up poor quality mp3s and letting a machine synchronise them; one commentator likens buying records off the internet to drinking at home. Vinyl is seen as the golden medium, encouraging lots of fetishistic comments about its fragility, malleability and even artistic merit, while others counter this with a view that the medium itself doesn’t matter – it’s the ideas that make something original or not. Minus artist and Richie Hawtin protégé Matthew Jonson (they even dress the same and have the same hair) sums it up perfectly with ‘the machine will never have the idea’. Throughout the film, the ‘human’ quality comes through in a loud way – perhaps somewhat surprisingly for a strand of music that is supposedly all about technology. That human dimension appears most negatively with diatribes against the super-DJ where showmanship has overtaken the actual music, or in discussions about ‘live’ versus programmed music where mistakes can happen, therefore allowing a real unpredictability can creep in. Carl Craig talks enthusiastically about the influence of jazz on dance music, an often overlooked input into the genre and one which perfectly illustrates the impact of individual flair over lumpen technology. Mute‘s own Apparat (Sascha Ring) offers his own slightly bemused reaction to talking to people in clubs and finding that people don’t know – or don’t care – who’s on the bill, as if the natural conclusion of the so-called facelessness of techno’s logical conclusion comes as a surprise to him. The film is a bit rough around the edges, especially with regard to the subtitles, but this globetrotting film was shot with evident care and attention – much more so than most lo-fi productions. The soundtrack features a number of intricate pieces by De La Calle himself which had this reviewer feeling nostalgic for his old techno collection. For Mute fans, as well as Apparat, Speedy J and BMB‘s Surgeon also appear as talking heads. The film can be streamed at Eduardo De La Calle’s website or below.